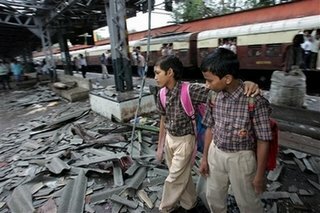 On Tuesday, a series of co-ordinated bomb attacks on Mumbai’s local train network killed 200 people. This isn’t new for Mumbai citizens or for Indians in general. It still churns your stomach, however, to see visuals of mangled train coaches, disjointed limbs scattered amid the wreckage, and blood-splattered victims waiting for help. 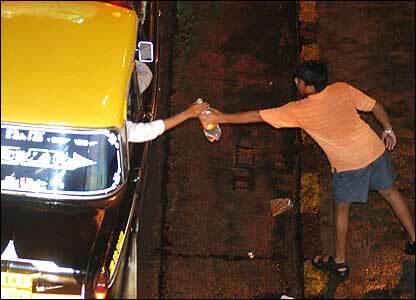 A boy hands water bottles to passengers passing by in vehicles on the day of the blast. A lady providing water to commuters passing by. 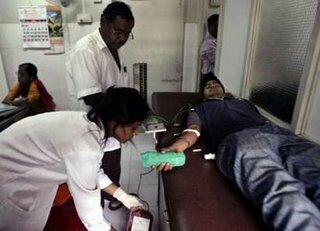 A young man donates blood at a Mumbai hospital on the day of the blast. 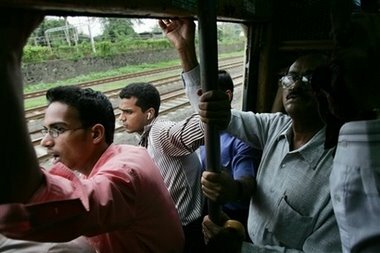 Mumbaikars board local trains and get back to work the morning after the blasts. Please take a moment and light an e-candle by clicking this CNN-IBN link. For every candle lit (no money required), the news channel will donate a rupee toward the relief of the blast victims. Thanks. What a wonderful post 🙂 This is what it’s all about, focusing on the good, the positive. It’s the only way in a world of madness. How lovely to have found this little post. Made my day. I was shocked at the news. I’ve been following the story. It just makes you want to cry. It is the great goodwill, and love for a fellow human that the Mumbaikars have come out in aid of the affected. 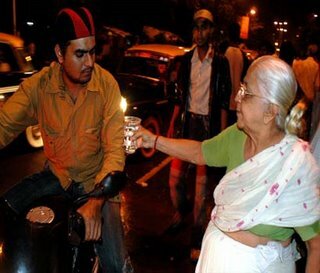 Thumbsup to the Mumbaikars !! !The World of Terrorists will now know and learn that that Mumbai is not afraid. These people who have committed such barbaric acts should be punished till every nerve is pulled out their skin.No words can console the people affected. But do hope that the effected do be able to build their life right again. Once again, it is the courage, compassion and decency of ordinary people that light the darkness. I too am impressed that you are focused on the positive aspects of this situation. After 9/11 here in the US, my heart leapt at the sheer goodwill that we had for one another, not just in this country, but abroad. For a brief time I felt like I belonged to something larger. I don’t know what the solution to these problems are, but I hope someday we can do something about the people that perpetrate these horrible acts. All I know is, you cannot crush the spirit of a people/nation with weapons or fear.Still, this is heartbreaking. I think in this case it was the devils who learnt a lesson. None of their intentions to cause economic, communal and psychological pandemonium were achieved. Thanks for illustrating the heart that terrorists lack. And with the stock up market 3% the very next day, I think one of those murderous scum’s prime objectives was wiped out pretty convincingly. What a city! So sad. Thank you for putting a human face on the brutal attack. Thanks for consolidating these photos and presenting them here, along with a method to help. I did participate, although I don’t see why they need to know my phone number to commit an act of charity. You’ve used your writing abilities in a supremely positive manner, and I salute you, dear. So very sad. Thank you for highlighting the compassion among the devastation. I’m so sorry for the terrible ordeal your country is experiencing. My prayers are with you for your safety and protection, along with peace for your country. Your post shows the compassion during difficult times. These people are true heroes. Huge cyber hugs, dear friend! Sorry for the delay in responding to the last few comments. Georganna, thanks for the kind words. It’s the least I could do. I can appreciate your concern about the telephone number, but I think they’re just asking for them to keep in their records. CNN-IBN is one of the most prestigious news channels in India, and I feel their effort to get people involved in this way is praiseworthy. Thanks again, for making the effort to visit the site :)Thanks Jeff and Lisa :)Lisa, welcome to my blog. People in India are a blessed lot too. As we all know, terrorist attacks aren’t just limited to the Indian territory. Scary.